This one is stretching the theme a bit in that he’s more of a supervillain than a monster. Still, I don’t want to live in a world in which an alien with an exposed brain doesn’t qualify for monsterdom. Dr. Evil (no, not that one) was the confirmed foe of ’60s superhero toy Captain Action. The good Captain’s schtick was that he could don costumes and masks to become 13 different licensed heroes including Superman, Flash Gordon, the Lone Ranger and the Green Hornet. Dr. Evil didn’t enjoy the same range of alternate personas, though he did come with a mask to make him appear human. While Captain Action and Dr. Evil have been reissued several times over the ensuing decades–you can find them collecting dust in your local Toys ‘R Us right now–mine is an original ’60s model. 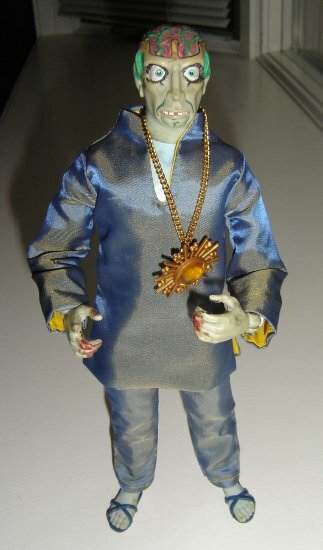 He still has his Nehru suit, sandals and funky medallion. He has, however, been modified a bit. When I was in high school, my classmates and I used him as the subject of a fake TV commercial. Redubbed “Blood Bath Bob,” his face was touched up by my artist friend Rocco, and I daubed his hands with red nail polish to represent the gory evidence of his victims. Good times, good times.